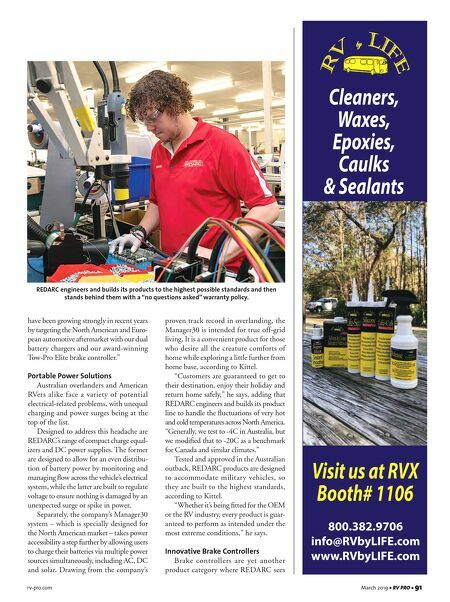 rv-pro.com March 2019 • RV PRO • 91 have been growing strongly in recent years by targeting the North American and Euro- pean automotive aftermarket with our dual battery chargers and our award-winning Tow-Pro Elite brake controller." Portable Power Solutions Australian overlanders and American RVers alike face a variety of potential electrical-related problems, with unequal charging and power surges being at the top of the list. Designed to address this headache are REDARC's range of compact charge equal- izers and DC power supplies. The former are designed to allow for an even distribu- tion of battery power by monitoring and managing flow across the vehicle's electrical system, while the latter are built to regulate voltage to ensure nothing is damaged by an unexpected surge or spike in power. Separately, the company's Manager30 system – which is specially designed for the North American market – takes power accessibility a step further by allowing users to charge their batteries via multiple power sources simultaneously, including AC, DC and solar. Drawing from the company's proven track record in overlanding, the Manager30 is intended for true off-grid living. It is a convenient product for those who desire all the creature comforts of home while exploring a little further from home base, according to Kittel. "Customers are guaranteed to get to their destination, enjoy their holiday and return home safely," he says, adding that REDARC engineers and builds its product line to handle the fluctuations of very hot and cold temperatures across North America. "Generally, we test to -4C in Australia, but we modified that to -20C as a benchmark for Canada and similar climates." Tested and approved in the Australian outback, REDARC products are designed to accommodate military vehicles, so they are built to the highest standards, according to Kittel. "Whether it's being fitted for the OEM or the RV industry, every product is guar- anteed to perform as intended under the most extreme conditions," he says. 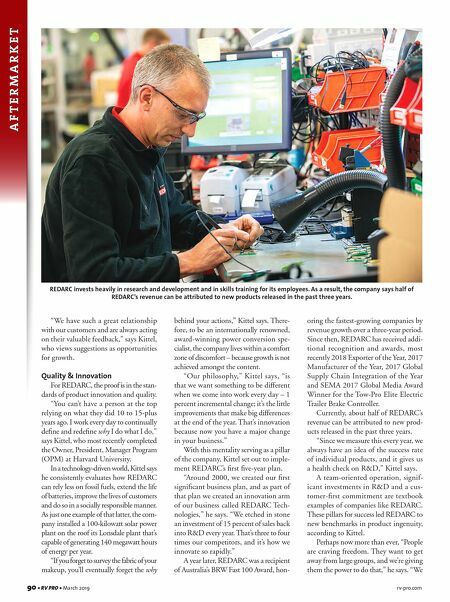 Innovative Brake Controllers Brake controllers are yet another product category where REDARC sees REDARC engineers and builds its products to the highest possible standards and then stands behind them with a "no questions asked" warranty policy.